We recently attended the Cherokee County Business Expo hosted by the Cherokee County Chamber of Commerce. It was a lot of fun and great to meet some of the other local businesses and community members. One of the many great people we met while at our booth, was a representative from Woodstock High School. Woodstock High School has an intern program taking place for their senior year students and one in particular was interested in technology. The representative asked us about taking on an intern and we were excited to help out. Alex is a great guy so far and has been able to put up with us pretty well. He’s polite, smart and doesn’t seem to mind cleaning the bathroom. Just kidding, we don’t make him do that … yet. We knew Alex was a good fit when on his first day here, John printed a document and before John was able to get out of his chair, Alex jumped up and retrieved the print job off the printer and brought it to John. Take note other interns: that’s how you do it. We’re still getting to know Alex the Intern here as it’s only his second week but we’d like your help in mining the deepest recesses of his past. Or, you know, just figuring out what he likes to eat for lunch, what his favorite video game is, favorite movie and that sort of thing. We’ll start having a semi-regular segment called “Ask Alex the Intern!” where you can ask Alex anything you’d like. You can leave questions on our Facebook wall, Tweet them to us, email us or leave them in the comments of this blog post. We don’t care how questions get here; just get ‘em here. Who knows, if we’re feeling especially artsy (read: have too much time on our hands one day) we may even video tape Alex the Intern answering your questions and post it to the blog. 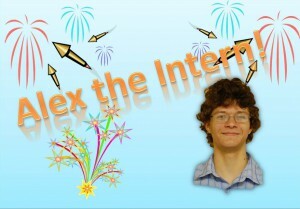 Alex, if you read this (he has to; it’s part of his internship) welcome aboard! We look forward to the coming school year and having you around the office.